This Hyundai i10 is available in Silver, Black, White, Red, Blue other colours and lease options, subject to availability and includes a warranty. Streetwise, nippy and surprisingly spacious, the irresistible Hyundai i10 comes equipped for the city. Boasting the longest wheelbase in its class and with three rear seats, you can pack more in to the i10 - whether it's friends, shopping, or the kids. Offers include manual and automatic transmissions. Which Hyundai i10 are you going to lease? We offer top quality Hyundai i10 from brand new, nearly new, slightly used or ex demo, whether you have good or poor credit rating, pay a low or no deposit. These Hyundai i10 can be leased or financed and come with a warranty, HPI checked and when contract hire leasing, include UK nationwide delivery and AA or RAC Roadside Assistance cover for peace of mind. Time4Leasing can offer you the latest Hyundai i10 lease deals at lower prices because these vehicles are exclusive and offered at lower rates to customers that have good, poor or even bad credit history score ratings. The 1.0-litre three-cylinder engine in the Blue model grabs the headlines thanks to fuel economy of 67.8mpg and CO2 emissions of 99g/km – meaning zero road tax or congestion charge. However, we reckon the four-cylinder 1.2 is a better bet. It’s more flexible, still returns 61.4mpg, and only costs £20 per year in road tax. Critically, it costs much less than the Blue, and you’ll have to drive well over 100,000 miles before the 1.0-litre engine’s superior fuel economy repays you. Blue and Classic models have essentials like air-con, electric front windows, and a CD player with USB port. Indeed, the 1.2 Classic is our favourite. We’d understand if you went for Active, though - it adds remote locking, alloys and powered rear windows for just a few hundred quid. Range-topping Style cars come with loads of kit, but cost more than an i10 should. Whichever version you buy, you’ll enjoy a five-year, unlimited-mileage warranty with roadside assistance thrown in. 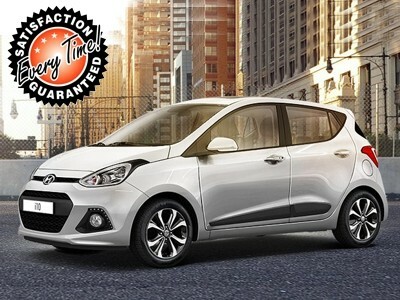 There are 37 Hyundai i10 Lease Deals on Offer.